It is December AD 79. In the Roman port of Ostia braziers are lit, hot spiced wine is brewed, and soft fur covers are brought out from cedarwood storage chests. It's the season of Saturnalia, a pagan festival where anything can happen. When a Roman widow begins to show a keen interest in Captain Geminus, his daughter Flavia and her friends have to find out if she really loves him or is just after his money. To do that, Flavia has to undertake the twelve labors of Hercules. And there is a lion on the loose! 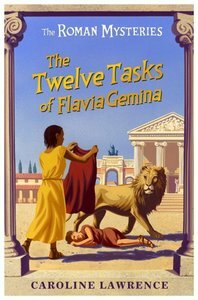 About "The Twelve Tasks of Flavia Gemina (#06 in Roman Mysteries Series)"